Mix the flour, sugar, salt and yeast in a bowl. Pour in the water and milk, mix and knead into a soft dough. Cover and leave to rise at room temperature for approx. 1½ hrs. until doubled in size. Place the butter between two sheets of baking paper, roll out into a rectangle (approx. 20 x 25 cm), chill for approx. 30 mins. On a lightly floured surface, roll the dough out into a rectangle (approx. 25 x 40 cm). Place the slab of butter over two thirds of the dough, leaving a border of approx. 1 cm on three sides. Fold the exposed dough over the top, place the folded dough over the remaining dough. Press the edges down firmly. On a lightly floured surface, roll the dough out vertically into a rectangle (approx. 25 x 40 cm). Then fold up one third of the dough and fold the top third down over the top. Wrap in cling film and chill for approx. 30 mins. Repeat this step three more times. On a lightly floured surface, roll the dough out into a rectangle (approx. 25 x 50 cm). Using a sharp knife, cut the dough into 8 equal triangles. Make a 1 cm notch in the centre of the short side of each triangle, stretch the dough out slightly. Roll up the pieces of dough. 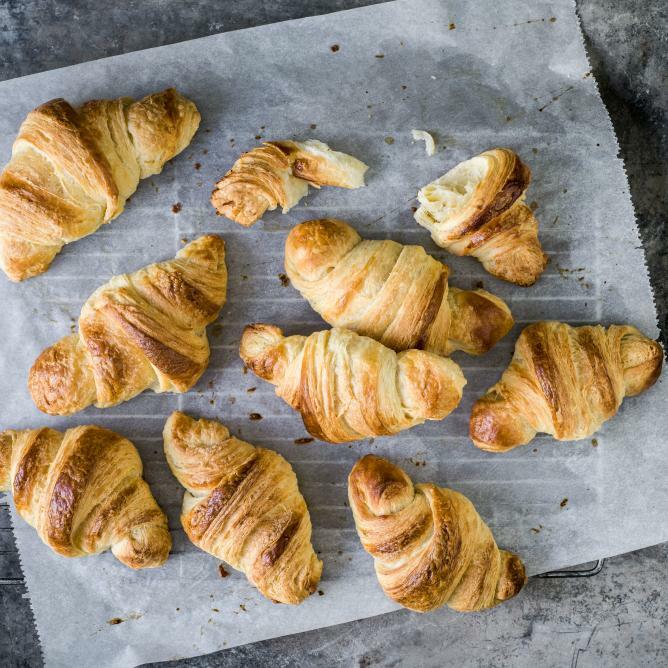 Place the croissants (pointed end down) on a baking tray lined with baking paper. Cover and leave to rise at room temperature for a further 30 mins., brush with a little egg. Approx. 30 mins. in the centre of an oven preheated to 200°C. Remove the croissants from the oven, leave to cool on a cooling rack.